As a follow-up to yesterday’s post on activation energy and developer adoption, today I’m going to extend the metaphor of chemical reactions by adding the concept of catalysis. 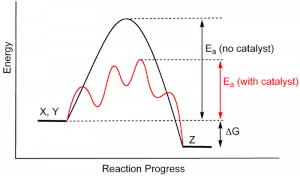 In chemistry, catalysts are generally thought to work by lowering the activation energy (Ea) that creates the barrier between initial and final states. 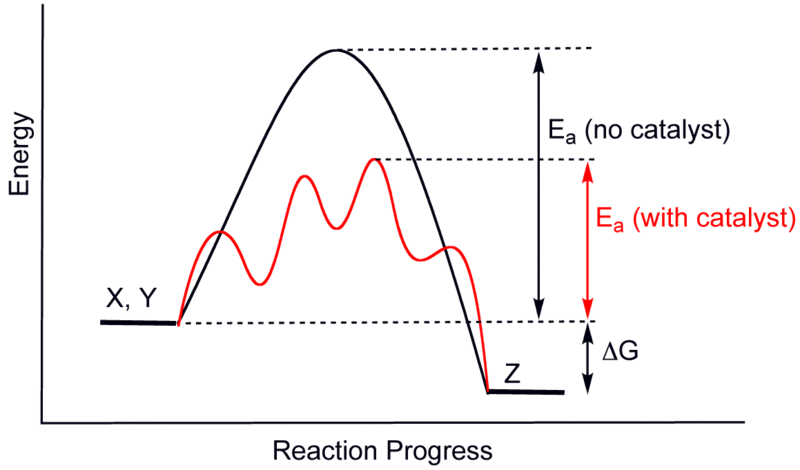 In the figure below, we’re seeing a chemical reaction proceed from left to right with the energy peaking right in the middle. In black is the standard reaction, and in red is the catalyzed reaction. By creating and providing catalysts for all the barriers in your adoption funnel, you’ll be able to get all those people who may be less motivated initially but have the potential to be great contributors and/or customers in the future. Hi, I'm Donnie Berkholz. I was formerly a senior analyst at RedMonk and our "resident Ph.D."
I quantified and analyzed the art & science of software creation and its usage by developers, data scientists, sysadmins, and everyone in between. My background is diverse, including stints in biophysics, open-source software development & leadership, IT infrastructure, and journalism. Are we nearing peak language fragmentation? نور محمد محمود on Are we nearing peak language fragmentation?